The next-generation A8 is shown during tests in Europe. 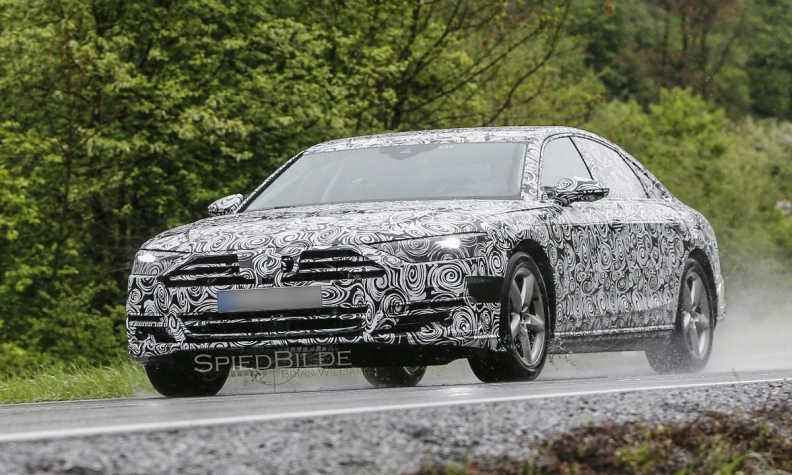 Spy photographers have caught Audi putting its next-generation A8 flagship sedan through the paces on public roads in Europe ahead of its release next year. Free of heavy camouflage, the A8 testing mule appears to show how design elements drawn from the Prologue series of concept cars will appear in production form as the A8 kicks off the next era of Audi design. For example, the A8's fast roofline, thin C-pillar and narrow greenhouse are hallmarks that Audi design chief Marc Lichte has said will help define the look of Audi's sedans, including the next generations of the A6 and A7. Another element drawn from the Prologue series is the clean, simple surface texturing, a move away from the multiple character lines seen on recent Audi products such as the Q7 and Q2 crossovers. Like other recent Audis, the A8 mule sports the latest evolution of Audi's trademark "single-frame grille." It also appears to show production-ready headlight and taillight designs. Audi has confirmed the redesigned A8 will appear next year. The flagship will introduce Audi's Traffic Jam Pilot system, a self-driving system for congested roads and highways at speeds of up to 60kph (37mph). It was rumored that Audi may move the A8 to the Volkswagen Group's MSB platform, developed by Porsche, for rear-wheel-drive vehicles with front-mounted engines. But the A8 mule appears to have a dash-to-axle ratio too short for a rear-drive vehicle, meaning the A8 most likely is based on the latest version of the MLB platform for longitudinally mounted engines, where it will utilize Audi's vaunted Quattro all-wheel-drive system.